Introduction: Laparoscopic partial gastrectomy is frequently performed for the treatment of gastric submucosal tumor, especially less than 5cm. Resection with an automatic suture instrument is associated with excessive removal of gastric mucosa for intraluminal growing tumors, which may result in postoperative stenosis or distortion. 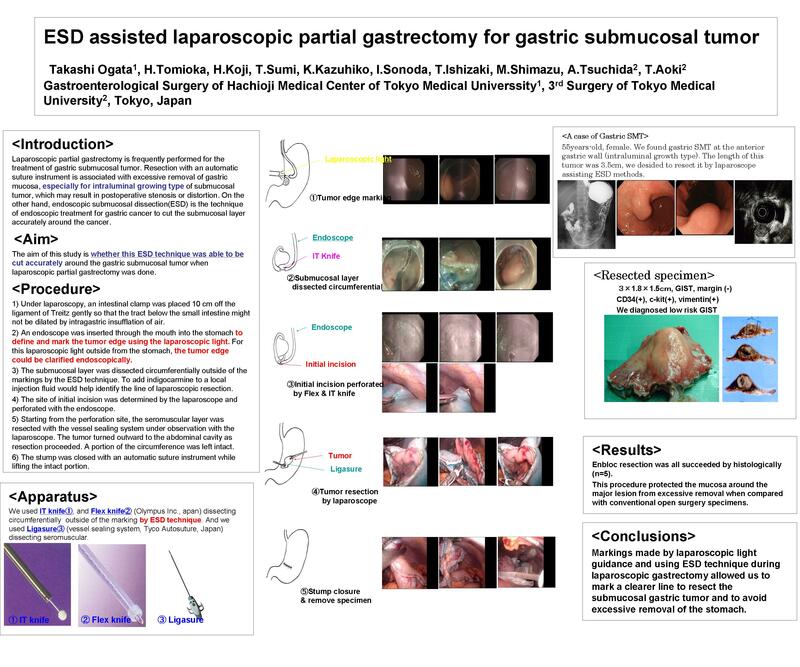 A laporoscopic partial gastrectomy assisted by ESD to prevent excessive removal of mucosa and to mark a line of resection properly allowed us to achieve a minimal resection of the stomach. Methods: ? Under laparoscopy, an intestinal clamp was placed 10 cm off the ligament of Treitz gently so that the tract below the small intestine might not be dilated by intragastric insufflation of air. ? An endoscope was inserted through the mouth into the stomach to define and mark the tumor border using the laparoscopic light. ? The submucosal layer was dissected in the whole outer circumference of the markings by the ESD technique. To add indigo carmine to a local injection fluid would help identify the line of laparoscopic resection. ? The site of initial incision was determined by the laparoscope and pierced with the endoscope. ? Starting from the pierced site, the seromuscular layer was resected along the line with the LigaSure® system under observation with the laparoscope. The tumor turned outward to the abdominal cavity as resection proceeded. A portion of the circumference was left intact. ? The stump was closed with an automatic suture instrument or handsawn technique. Results: This procedure helped us to show the resection line clearly under laparoscopic view, and protected the mucosa around the major lesion from excessive removal compared with conventional open surgery specimens. Conclusions: The use of ESD during gastrectomy allowed us to mark a clearer line of resection and to avoid excessive removal of the organ.